Foam-Handled Cutlery for those with weak grip. 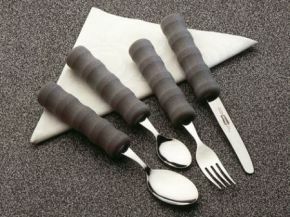 Mounted on plastic stems then hygienically sealed into light grey foam handles, this foam handled cutlery set provides help to those with weak grip or arm power. The chunky but lightweight nature of the handles makes them ideal for arthritis sufferers too - with the sculptured closed cell foam with finger contours making them easy to grip. Available as a full set (tea spoon, spoon, fork and knife) or separately, these items are washable (but not recommended to use in dishwashers). Excellent service. Very pleased with cutlery as not too heavy. This cutlery is lightweight and easy to hold with a weak grip. Thank you so much for your fast response and rapid delivery of a Foam-Handled Cutlery set. I am just delighted to have replacements. The original set was purchased for me four years ago when Vasculitis damaged peripheral nerves, and they have been such a help in regaining correct hand and finger control and now, as the nerves are gradually regenerating, they cushion the pain of holding utensils; holding most normal knives and forks is like grasping sharp blades. The serrated knife blade is very good. \"Madam! Knife, knife! In bag!\" Aaaaargh! (Oh, no!) \"Sorry, Mama. Can-nnot, can-nnot!\"
However, my husband and the wheelchair guy managed to pull the blade out of the handle and, at the Bangkok hotel, I was supplied with a knife which fitted the handle perfectly. It was rather heavy so meats were still cut up for me for the next two months and it\'s such a relief to be independent and invisible again. The order was delivered very efficiently, but I still seem to have problems with handing them but I hope after using them more and more this will alter.